Not many manufacturers of NIBP simulation devices can make the claim that they have worked as closely with the actual NIBP monitoring manufacturers, or at least not to the same level of involvement that has resulted in the AccuSim NIBP simulation technology platform. Even fewer can make the claim that they have physiologically-correct waveforms in their NIBP simulations. And the smallest group would be those that can claim 0.5% of setting accuracy on dynamic NIBP simulations. But Datrend Systems can make all three of these claims relative to the AccuSim NIBP technology platform for NIBP simulation. Perhaps best of all, is the fact that the AccuSim-BP Desktop NIBP Simulator is a part of the Datrend ES601 Plus test automation family. This means that you can connect your AccuSim-BP Desktop NIBP Simulator to your ES601 Plus for totally automated testing of your medical devices and test result storage. Finally, NIBP simulation numbers that match on your simulator and monitor! AccuSim-BP Desktop’s innovative CalTables™ deliver accurate testing of NIBP monitors, typically within 1-2mmHg or better, of the setting. 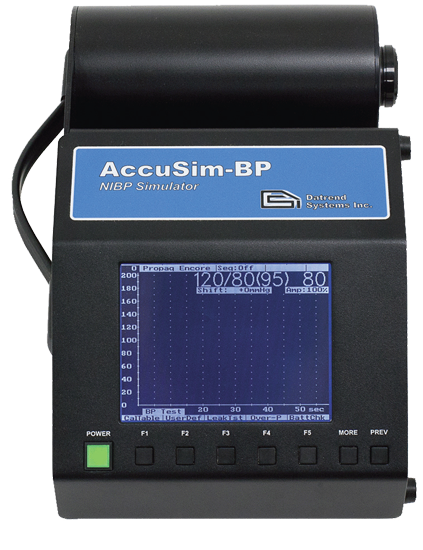 The AccuSim-BP Desktop’s CalTables™ were developed with, and certified by, NIBP monitor manufacturers. Everyone can now test using the same accurate and certified NIBP Simulator. AccuSim-BP Desk top’s innovative CalTables™ deliver what we consider to be the most accurate, repeatable, and reliable NIBP simulation on the market today! The AccuSim-BP Desktop includes CalTables™ for major manufacturers. CalTables™ updates ensure that your investment in the AccuSim-BP Desktop NIBP Simulator is protected well into the future. INTERNAL PUMP AND BATTERY: The AccuSim-BP Desktop has both an internal pump and rechargeable battery to maximize on the flexibility and portability of your NIBP simulation and testing. With the AccuSim-BP, there is no need for external cuff mandrels to support your NIBP simulation. NIBP device, cuff and analyzer.